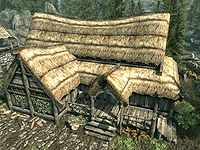 Dead Man's Drink is an inn in the town of Falkreath. It is owned by Valga Vinicia. It is located near the center of town, opposite Gray Pine Goods, next door to Corpselight Farm. Narri waits tables, although she can regularly be found outside leaning against the porch fence, while Delacourt is the inn's resident bard. It contains only one interior zone, Dead Man's Drink. * Appears here only after completing the Moss Mother Cavern quest. It is a single story building with a raised porch at the front, wooden stairs lead up to the entrance and a food barrel is in the corner. By the southern corner of the building is a wood chopping block and a couple of thistle that can be harvested nearby. Many of Falkreath's citizens congregate in the inn throughout the day and night. It is a typical Nord inn, with a fire pit down the middle of the common room. The counter is at the southwest end, with five long wooden tables along the southeast and northwest walls. There are three doorways leading to bedrooms, two on the southeast side and a larger one on the northwest side. There is an alchemy lab in the eastern corner and several barrels around the room. Behind the counter are two large vats with racks hanging from the ceiling in front of them. These hold nine rabbits and six pheasants, also hanging from the ceiling are two garlic braids, a bunch of frost mirriam and a bunch of elves ear. These are in front of a set of shelves holding bottles of wine and alto wine. On the counter are several pieces of cheese, a salmon steak, a bottle of alto wine and a bottle of wine. Under the counter is a copy of the Speech skill book A Dance in Fire, v6, five loose septims, a small coin purse, an iron war axe and several more bottles of wine and alto wine. Either side of the doorway into the larger bedroom are a set of shelves holding several loaves of bread, six bottles of wine, two bottles of alto wine, seven bottles of Nord mead and three bunches of elves ear. The long wooden table against the walls typically hold bread and a selection of wine and alto wine. However the middle table against the northwest wall also holds two chicken's eggs and the table on your right as you enter, next to the alchemy lab, also holds a selection of cheeses and two salmon steaks. There is a basket containing three pieces of firewood beside the fire pit. The larger bedroom is the room you will be shown to if renting a room for the night. It consists of a large double bed coming out from the northwest wall, with end tables holding a common book and bottle of wine either side. At the foot of the bed is an unlocked non-respawning wooden chest containing gold, and against the northeast wall is a long unlocked non-respawning empty chest. There is also a small square wooden table and chair against the southeast wall holding a small coin purse and four loose septims. The two smaller bedrooms are opposite the larger bedroom. To the left of the left-hand doorway is a flower basket containing three pine thrush eggs. The left-hand bedroom contains a single owned bed in the eastern corner with an unlocked non-respawning chest and wardrobe at the foot of the bed and a small round wooden table and chair beside the bed. On the table is a bottle of Black-Briar mead. The right-hand bedroom has a single owned bed in the southern corner, with an unlocked non-respawning chest and dresser at the foot of the bed and a small round wooden table and chair beside it. Both these chests contain only gold as well. All cupboards, wardrobes, and end tables in the location are non-respawning and safe to store items in. This page was last modified on 11 July 2017, at 04:28.